Following a damning United Nation's report which outlined a never seen before surge in extinction rates around the world, WWF today launches its biggest public campaign to date, The Future is Man Made. The Global Biodiversity Outlook 2 report found that the rate of species extinction is at the highest level since dinosaurs became extinct 65 million years ago. "In light of this report and many other preventable disasters - particularly relating to Australia - WWF is urging all Australians to adopt solutions to our most urgent environmental threats," says WWF-Australia CEO Greg Bourne. The Future is Man Made campaign will provide Australians with regular tips and suggestions on how to reduce our impact on the climate, freshwater and food supplies, leading to more sustainable lifestyles. All people need to do to become a Futuremaker is visit the campaign site and join. The smallest of actions can make a big impact. For example, by simply changing the household showerhead to one with a AAA rating, up to 59,000 litres of water per household annually can be saved. That's more than a staggering 100,000 bottles of Mt Franklin water. "We all have the power to stop our country and the world heading towards irreversible damage," says Mr Bourne. "What we are seeing today is between 25,000 and 50,000 species becoming extinct every year. At this rate, half of the world's species of plants and animals will be gone by the end of the 21st century. "Becoming a WWF Futuremaker has three parts - it is about understanding that we are using 20% more resources than the earth can sustain and we are killing off the plants and animals at an unbelievable rate, secondly, it's about deciding whether that is ok with you. "The third and most important part is this: Become a Futuremaker and make a commitment towards creating a sustainable future by changing every day habits, which the campaign website outlines," says Mr Bourne. "We believe Futuremakers can use their power to make a monumental change in the market, in politics, in their communities and in how we all go about our lives. "We're only just starting to realise the power of an individual choice made everyday and millions of times over," says Mr Bourne. A dripping tap loses 2,000 litres of water per month or 24,000 litres per year - fix your taps and report dripping taps in public spaces. A WWF Futuremaker will receive regular information about the effects of over-exploitation of natural resources and provide practical ways to make a difference. Small life changes make a big impact, like deciding what products we buy, how we travel, how much water we use or even which energy contract we sign. 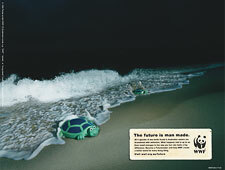 WWF is committed to helping Australians understand how we are making our future, so they can make informed decisions. WWF works throughout Australia to stop dangerous climate change, end land clearing, and preserve and protect our fresh water, marine and land environments. While saving all creatures great and small is something WWF is very proud to be associated with, it's just one part of what we do. Become a WWF Futuremaker now, visit the campaign site to join thousands of people who want to make a better future. "We still have an opportunity to stop the disappearance of thousands of species and the destruction of our own - become a Futuremaker today," says Mr Bourne.